Forget those mall jewelry stores. This is the experience you want with the band and box you deserve. Long-time friends, Dan & Rob, were talking about how much of a hassle it was to find the right band when it came time to marry their lovely wives. Predator-like salespeople giving bad style suggestions, the same old gimmicks, multiple trips to the jewelry store, traffic and what seems like an endless amount of time in-store only to discover that the band choices are terrible, overpriced and worst of all come in a basic velvet box. That's when they decided no one else should have to go through what they did (all of the above). Enter...Jude Ridge. Stylish, scratch-resistant premium tungsten bands that come with a premium wood box and free worldwide shipping at an affordable price. No pressure. No gimmicks. No bad memories of an outdated retail experience. Just simple, stylish and affordable mailed straight to your door without all the headaches. Our small team located in South Carolina & Virginia works hard everyday to serve our customers as well as they would their friends and family, because that's who our first customers were, our friends and family. 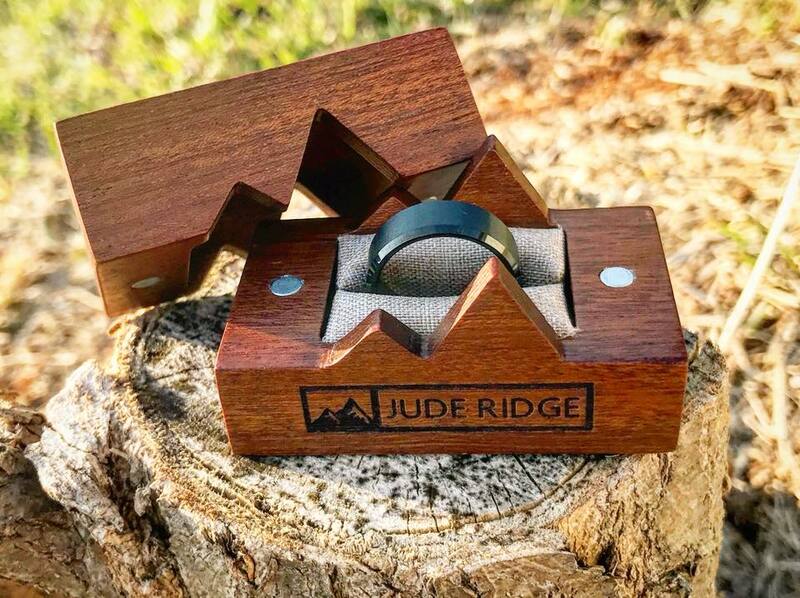 Whether you're looking for a wedding band, engagement band, promise band or just a cool band to accentuate your style, Jude Ridge has you covered. We know you don't want the run-around. That's why we keep it simple. One premium tungsten band, one premium wood box, free worldwide shipping at one simple price. No need to search to the ends of the Internet looking for a promo code or shipping discount. You know you're getting the best price, the best value and the best service every time. We want you to have peace of mind. That's why we offer free returns and exchanges, as well as a lifetime exchange plan should you need a different size at some point down the road. If you have any questions or concerns, don't hesitate to visit our Frequently Asked Questions page, send us an email or give us a call. The customer service team will make sure you're taken care of. Don't know your band size? It's all good. We've got you covered. We can ship you a free physical band sizer kit or you can download and print our free band sizer PDF, so you can determine what size you need then place your order accordingly. Or, if you'd rather verify your band size in person and are brave enough to take on what awaits you, we actually encourage you to visit one of those mall jewelry stores to determine your size. We're so confident that you'll come back to our site after the horrific experience just from getting a band size that we're not worried at all. We know in the end that will just make you appreciate buying from Jude Ridge even more. Already know your band size? Great! You're all set. We're ready to help you get the premium band and premium box you deserve.